Dr. Thomas Lintner, a plastic surgeon in Marietta, discusses how tummy tuck surgery can help individuals after childbirth or dramatic weight loss. 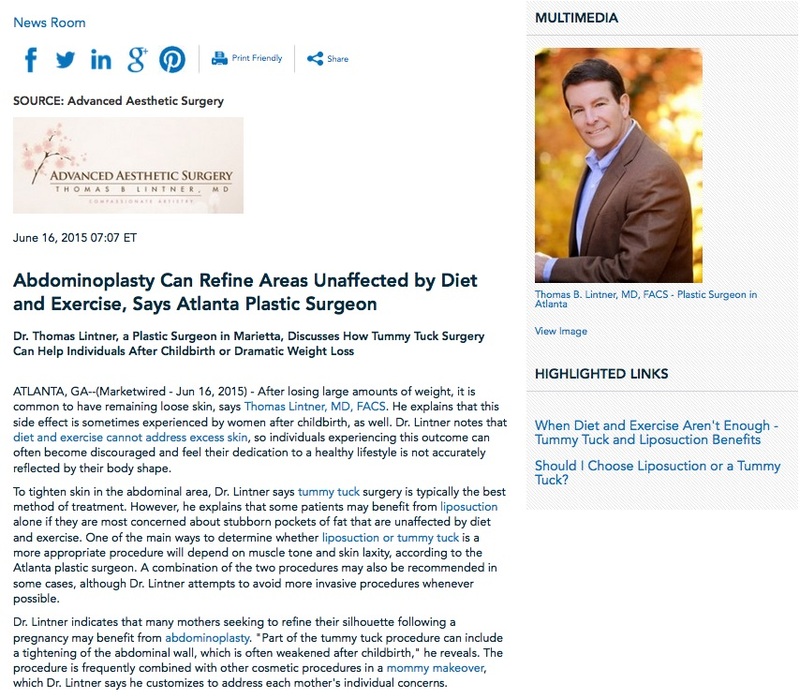 Atlanta, GA — After losing large amounts of weight, it is common to have remaining loose skin, says Thomas Lintner, MD, FACS. He explains that this side effect is sometimes experienced by women after childbirth, as well. Dr. Lintner notes that diet and exercise cannot address excess skin, so individuals experiencing this outcome can often become discouraged and feel their dedication to a healthy lifestyle is not accurately reflected by their body shape. To tighten skin in the abdominal area, Dr. Lintner says tummy tuck surgery is typically the best method of treatment. However, he explains that some patients may benefit from liposuction alone if they are most concerned about stubborn pockets of fat that are unaffected by diet and exercise. One of the main ways to determine whether liposuction or tummy tuck is a more appropriate procedure will depend on muscle tone and skin laxity, according to the Atlanta plastic surgeon. A combination of the two procedures may also be recommended in some cases, although Dr. Lintner attempts to avoid more invasive procedures whenever possible. Dr. Lintner indicates that many mothers seeking to refine their silhouette following a pregnancy may benefit from abdominoplasty. “Part of the tummy tuck procedure can include a tightening of the abdominal wall, which is often weakened after childbirth,” he reveals. The procedure is frequently combined with other cosmetic procedures in a mommy makeover, which Dr. Lintner says he customizes to address each mother’s individual concerns. After dramatic weight loss due to extreme diet and exercise or bariatric surgery, Dr. Lintner says many patients seek to tighten loose skin on their abdomen. With tummy tuck surgery, excess skin can be removed, resulting in a flatter abdomen. Dr. Lintner says this procedure has provided many of his patients with improved self-esteem, as well. He reminds patients that other areas of the body can also be refined with a body lift, which can be tailored to each patient’s needs. Whether individuals are seeking to remove stubborn fat or excess skin, Dr. Lintner strongly recommends for patients to contact experienced board-certified plastic surgeons in their area and conduct thorough research prior to moving forward with any body sculpting procedures. Dual board-certified plastic surgeon Dr. Thomas Lintner is the head of his private practice in the Atlanta area, Advanced Aesthetic Surgery. He is a Fellow of the American College of Surgeons, and is a member of several prestigious medical organizations, including the American Society for Aesthetic Plastic Surgery and the American Society of Plastic Surgeons. Dr. Lintner’s practice offers a wide range of surgical and non-surgical cosmetic procedures, including BOTOX® Cosmetic, breast augmentation, tummy tuck, liposuction, and mommy makeover. To learn more about Dr. Lintner and his practice, visit tomlintnermd.com, atlantamommymakeover.com, and facebook.com/tomlintnermd. Dr. Lintner is available for interview upon request.